Stock Set from the Lloyd Flanders Fusion Collection. Set as shown includes:  Fusion Sofa,  Fusion High Back Swivel Chairs,  Fusion End Table ** NOTE: Firepit Table is not part of this set and is sold seperately. Information for firepit is given below. 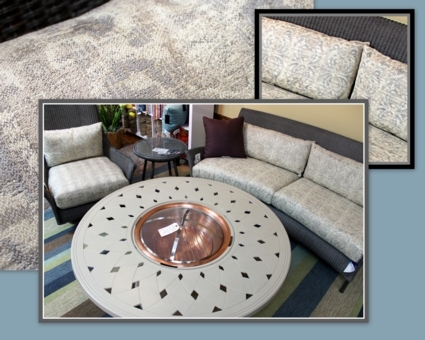 ** ALSO SHOWN IN PHOTO: Telescope Casual Brand (wood burning) 54" Round Firepit Table with Pedestal Base. Frame: Textured Desert.